REUTERS/Larry DowningU.S. 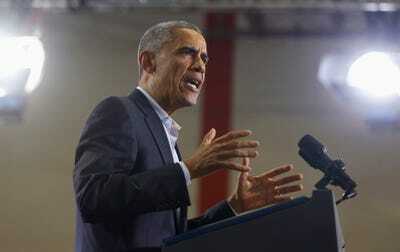 President Barack Obama talks at a campaign event for the re-election of Connecticut Governor Dan Malloy while at Central High School in Bridgeport, Connecticut, November 2, 2014. First, many details of the training program have yet to be worked out, and the new national guard won’t be ready for at least six months. Second, the situation continues to deteriorate. 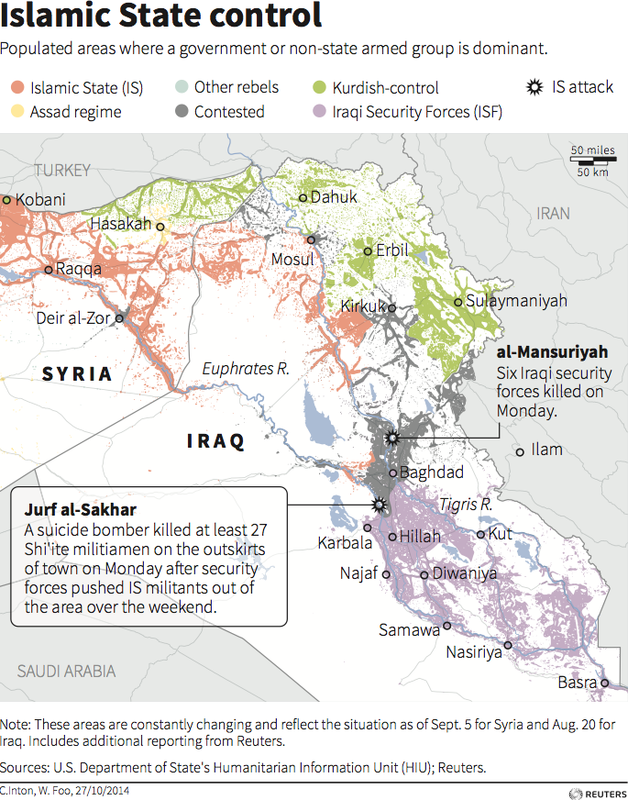 Islamic State militants have consolidated control of about 80% of Iraq’s crucial Anbar province by killing resisting tribesmen by the hundreds. Meanwhile, Shia militias — some of them backed by Iran — are using the fight against ISIS to burn Sunni communities to the ground. Third, Shia Iran remains a huge obstacle as it pulls the strings in Iraq’s Shia-dominated government and interfere with plans to arm Sunni tribesmen. The US won’t incorporate the Sunni tribes until the new Iranian-backed Shia government agrees to provide them with arms. The US also has to figure out how to train the Iraqi police — and the new interior minister, who is now in charge of the police, was previously a senior official of the Badr Organisation, a Shia militia trained and armed by Iran. The problems facing Obama’s plan to defeat ISIS are ironic given that the Obama administration effectively handed off Iraq to Iran as a way to remove U.S. troops and still stabilise the country. The opposite happened in the years after Washington went along with the plan created by Qassem Suleimani, the head of the Iranian Revolutionary Guard’s Qods Force, by continuing to support the authoritarian Iran-backed regime of Prime Minister Nouri al-Maliki. Khedery argued that the Obama administration “betrayed the promises that the U.S. government had made to the Sunni tribal leaders,” who had previously fought with American troops against ISIS-predecessor Al Qaeda in Iraq (AQI) during the Iraq War. Now those same tribes that US needs again are being co-opted or slaughtered by the ISIS militants who regrouped (with the help of Saddam-era officials) while Maliki polarised the country. ReutersSyria and Iraq, also known as ‘Syraq’ given the lack of effective border between the countries. Saving Iraq is also contingent upon political stability in Syria, where the Iran-backed regime of Bashar al-Assad continues to rain barrel bombs on civilian areas while al-Qaeda’s Syria affiliate routs US-backed rebels, ISIS runs a self-declared caliphate, and Tehran sends more fighters to bolster Assad. Meanwhile, the Obama administration is limited in how much pressure it can put on Iran since it is trying to sign a nuclear deal with Iran — the centrepiece of Obama’s foreign policy — in the next three weeks. So while Syraq burns and the White House scrambles for a nuclear deal, Tehran is using the ISIS crisis to its full advantage.